Screensaver Maker - Easily Make your own Professional ScreenSaver in Minutes, one of the best Screensaver Builder ! 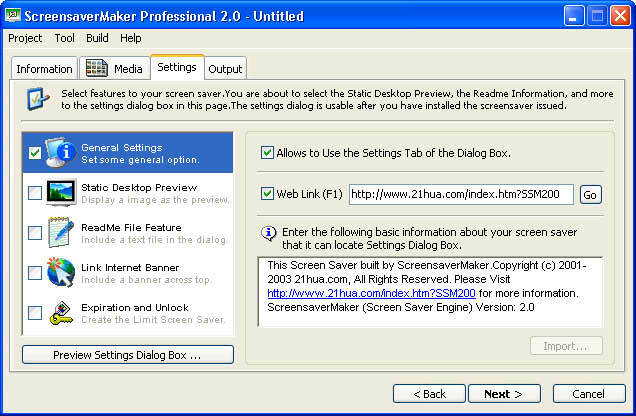 Screensaver Maker is a flexible authoring tool that makes it possible to create many different types of screen savers. 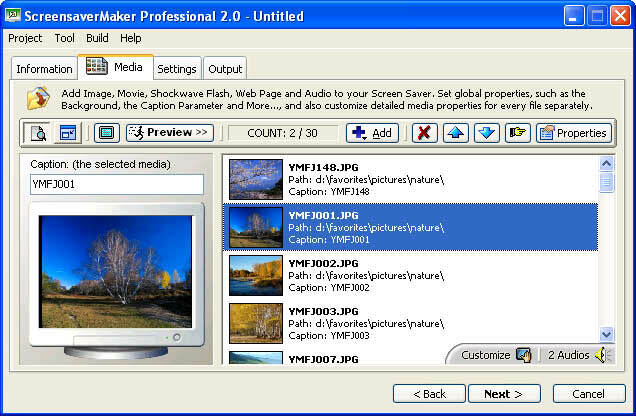 This tool lets you create screen savers based on Shockwave Flash, Image Slide Show, animations (FLC), Webpage and Movie (Quick Time, Mpeg, AVI...). You can make screen saver for Windows® 95/98/ME/NT4/2000/XP. Several Background options (solid, gradient, bitmap, original screen...) . Project Preview before saving or building. Customize Individual Scene - Sadjust individual scene's properties (position, effect, caption, 4 background, etc.). Advanced transition effects with over 100 combinations producing smooth transitions between 4 images, meanwhile supporting sound fx effect.